At Briarwood we are proactively addressing your rehabilitation needs in our dedicated 40-bed short-term rehab neighborhood. Reflective of our approach, we start planning your discharge immediately upon admission. Individualized care plans are crafted to ensure optimal healing – fully preparing you for your return home. With therapy delivered daily, our expert team of therapists uses the latest rehab technology and techniques to optimize your mobility and independence, and help you regain your overall sense of wellbeing. Our successful usage of the Interact 3.0 program in conjunction with our post-discharge follow-up care keeps rehospitalizations to a minimum. To assure your recovery doesn’t lose its momentum once you return home – we make sure to schedule your initial doctor’s visit before you leave Briarwood. 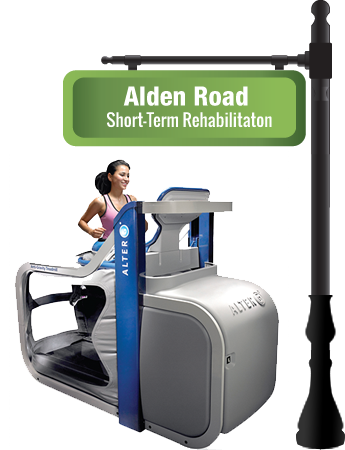 The revolutionary AlterG® Anti-Gravity Treadmill uses NASA technology to provide up to 80% body weight support – allowing you to run or walk with reduced impact.